In the movie, The Magic of Belle Isle, starring Morgan Freeman, Freeman moves to a small town for a summer and ends up mentoring a young girl, Finnigan, who is almost ten years old. She wants to be a writer. Knowing he was a writer, she asks him to teach her. They exchange $34.18 and he agrees to give her lessons. Their first lesson begins with both of them out by a road in their neighborhood. It is an ordinary looking road that one might see in many neighborhoods. The colors are a neutral palette: the green of leafy canopies, the beige of homes, the gray of concrete. Trees are here and there, neither plotted nor planned. Mailboxes line the street in soldier-like fashion. As the camera pans down the street, Freeman asks Finnigan to look down the road. “Tell me what it is you do not see,” he says to her. What is it that we do not see? What is it that we do not hear? I can tell you what I do hear oftentimes, cancer. It lightly treads around the edges of my consciousness looking for an opening to peek in and ask, “Remember me?” My neural pathways are well grooved (anymore tunneling and I’d show up in China, head first) when it comes to my mind and dealing with illnesses. I am missing other good life stuff as my mind travels down that familiar pathway. Since I want to create new patterns of thinking, going forward how am I going to handle adversity differently? Certainly there are times when the adversity will be front and center. If your child seems to be having allergic reactions to foods but you are not yet sure which foods, you’ll be giving that issue more brain space while it is being handled and resolved. Or, maybe you’ve just been diagnosed with breast cancer and need to make treatment decisions. But, during those times when we are handling difficult tasks, do we see what it is we are not seeing as Freeman was teaching Finnigan to do? Do we hear what it is we are not hearing? Are we able to maintain awareness such that we live in the present letting the past lie and allowing the future to come as it will? There are times in my life when I find this more difficult to do than others. Lately it has been difficult. So, I’ll be working on this in the coming months and years. (It is a lifetime practice.) Training to become more aware of what is, presently, rather than what could or should or might be. If we find ourselves getting caught up in frequent, repetitive thoughts, one idea is to give yourself and your mind a break. For one or two minutes, hear what it is you are not hearing. Maybe your toddler is softly humming to herself or the birds are singing. See what it is you are not seeing. Maybe the deep purple of cooked black rice could be the next best crayola color, or the clouds have taken on the hue of autumn’s evening light, deep gold. In shining our light of awareness on what it is we are not hearing or seeing, those familiar grooved pathways we are desirous of changing will become a little less worn. In cultivating this practice, we will develop our mindfulness muscles and create new neural pathways. Marcia Rose Shulman has well greased pathways in creating gorgeous food. 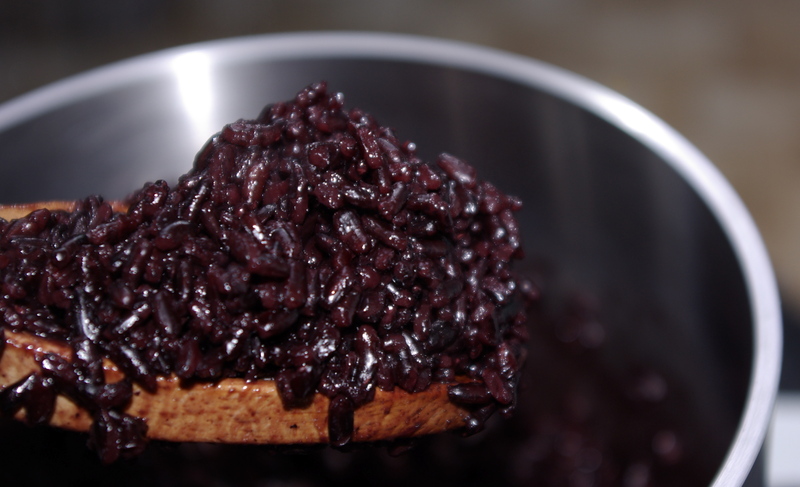 Her Black Rice Risotto is loaded with color, nutrition, and flavor. 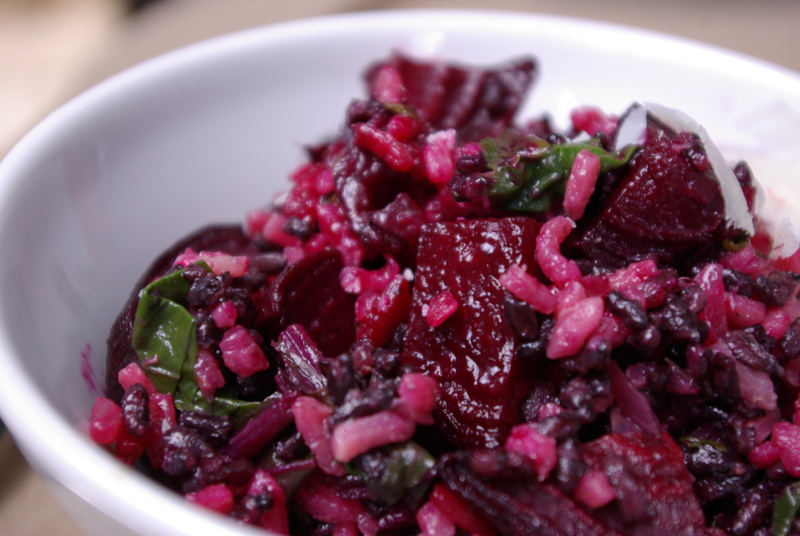 The magenta hue of the beets bleeds beautifully throughout the dish. Using two different grains provides different textures. The wine adds complexity and depth of flavor. Depending on how much cheese you choose to use, the traditional comforting creaminess of a risotto is intact. Below is my adapted version. I increased the vegetable to rice ratio. Omitted the cheese. (But included it as an option in the recipe for those of you who want to add it. A different cheese alternative could be Manchego. It would be nice grated over the top of the finished dish.) Roasted the beets with the skins on. And, substituted farro for the arborio rice to boost nutrition and texture. Cook black rice according to package directions, set aside. In a large saucepan, warm over medium heat 2 T. extra virgin olive oil. Once heated, add diced onion. 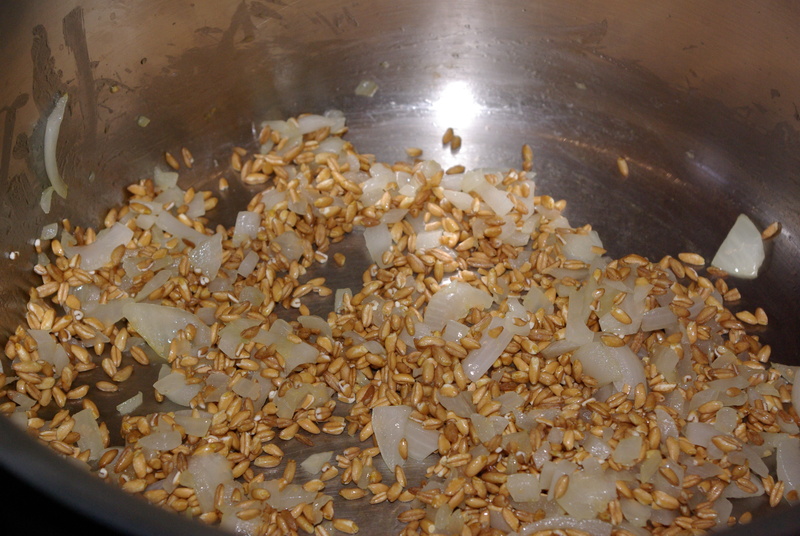 Sauté the onion until it begins to soften, about 3 minutes, add the farro and garlic. Cook, stirring frequently, until the grains are fragrant about 3 minutes. Meanwhile, heat 1 qt. stock in a medium saucepan to barely boiling. Cook the washed beet greens for about 10 seconds or less in stock, just until wilted. Remove greens with tongs reserving stock. Set greens aside to cut into bite size pieces. Turn heat down to simmer on the stock. Stir the wine into the grain and onion mixture. Continue stirring frequently until the liquid is absorbed. Continue adding 1/2 c. or so of broth, stir frequently. When liquid has been absorbed add another 1/2 c. or so of stock. Continue adding stock when liquid has been absorbed for about 25 minutes total cooking time until farro is al dente. Meanwhile in a large mixing bowl, place roasted beets, cooked beet greens, add amounts of cooked rice and farro to your liking, reserving the remaining grains for another meal*, add parmesan cheese if using. Combine well. Taste and adjust seasonings. Serve. *Marcia’s recipe calls for 1 c. cooked black rice. I used about 1/3 of the cooked rice. If desire less rice in the dish with fewer leftovers, 1/2 c. rice could be cooked. **To roast the beets: preheat the oven to 350°. On a large baking sheet place cut beets, toss them with salt, pepper and olive oil. Spread them out evenly. Roast 25 – 35 minutes until soft. Golden roasted beets with red lentils and toasted walnuts dressed with extra virgin olive oil, a drizzle of walnut oil, healthy doses of salt and freshly ground black pepper, and topped with herbed goat cheese, a recipe by Laura Calder I adapted. (Pictured before going into the oven), my go-to everyday whole wheat cake dotted with fresh kiwi, apricots, plums, diced dried apricots, and chopped pecans. 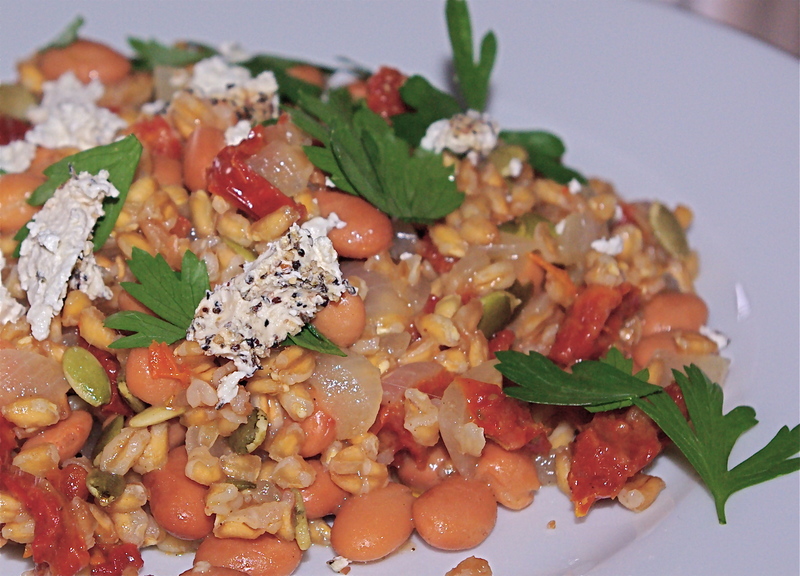 I am ushering in fall this week with one of my favorite grains, farro. Cooked risotto-style, the whole grain creates its own sauce while combining beautifully with its savory counterparts. I learned this risotto-style cooking technique from Martha Rose Shulman. It yields a lovely, chewy grain and is a healthier option than arborio rice, the rice traditionally used to make risottos. Toasting the grains for a couple minutes lends a more distinct nutty flavor to the dish. The addition of sun-dried tomatoes are sweet and chewy and the pinto beans give the meal more substance and texture. A sprinkling of pumpkin seeds lend crunch. The dish is equally as good served without cheese. In a large skillet heat 2 – 3 T. extra virgin olive oil, sauté onion over medium heat with a generous pinch of salt. Once onion begins to soften, about 3-4 minutes, add garlic. Stir for 30 seconds or so until garlic is fragrant turning heat down if necessary. 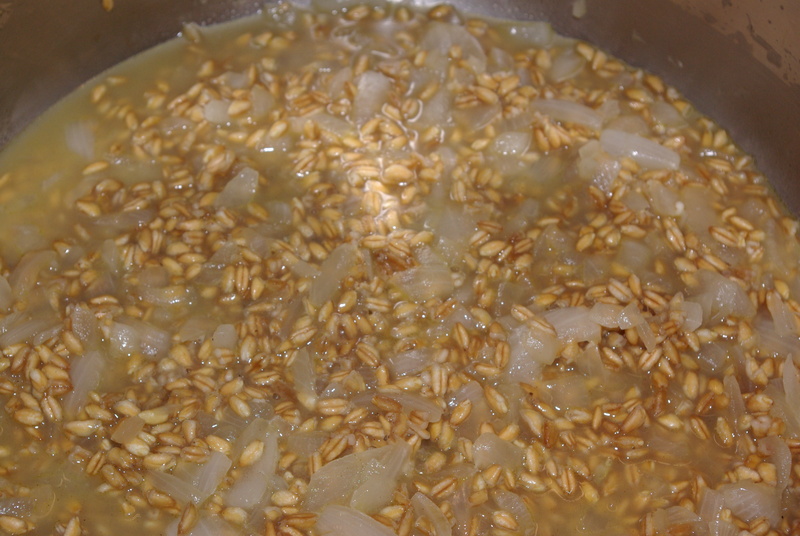 Add farro to the onion mixture, toast the grain for 2-3 minutes while stirring continuously. Add white wine, thyme, and freshly ground black pepper to taste. Stir to combine. Cook farro over medium to medium low heat maintaining a simmer while stirring frequently. Once the wine is absorbed, add about 1/2 c. of broth just until it barely covers the grains. Continue to cook while stirring frequently.